I had seen a few shield mantids or hooded mantids before in central america but this was the first one I saw in South America. I think this one is the Peruvian shield mantis (C. rhombicolis), despite being called peruvian this species is rather widespread. It has amazing camouflage which helps it remain concealed in the lush environments in which it lives. 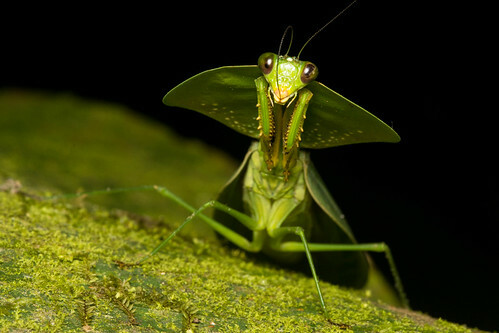 My understanding is that the function of the flattened thorax or hood is to aide in its camouflage and help break up the mantids shape. In this photo you can see the mantis cleaning its antennae by running it through its mouth and removing any debris stuck to it.